A day ahead of the Badminton Asia Championships in China, HS Prannoy has alleged that he and Sai Praneeth have been wrongfully left out of the tournament. Nozomi Okuhara defeated PV Sindhu in straight games in 37 minutes to set up a final against world No. 1 Tai Tzu Ying. PV Sindhu's consistency stood out in 2018. Yet former national coach Vimal Kumar believes she still isn't playing at her full potential. By the end of 2016, Saina Nehwal was being referred to as a has-been. In two years' time, she put together one of her most unforgettable years. No Indian has won the Malaysia Open, with Saina Nehwal and PV Sindhu having gone as far as the semifinals. Can they do better this time around? Viktor Axelsen shrugged off a testing week to put on a clinical performance at the India Open, providing evidence of the gulf that exists between Kidambi Srikanth and the best in badminton today. Since his triumph at the French Open in 2017, Kidambi Srikanth has a 1-11 record against the top five players in the BWF World Rankings. Defeat in the final of the India Open further exposed that gulf in class. Viktor Axelsen beat Kidambi Srikanth 21-7, 22-20 to win his second India Open title. Here's how it unfolded. Tired of comparisons to 2017, Kidambi Srikanth wants to look ahead. After 17 months and 15 tournaments, he is back to where he belongs - competing for the big titles. Kidambi Srikanth defeated China's Huang Yuxiang 16-21, 21-14, 21-19 to enter his first tour-level final since October 2017. After coasting to their respective semi-finals at the India Open, PV Sindhu and Viktor Axelsen will face their first genuine challenges over the weekend against Bingjiao and Kashyap. Once India's undisputed no.1, Parupalli Kashyap's career has been derailed by injuries. But having reached the quarterfinals of India Open, he's back with renewed self-belief. Isabel Zhong gave up badminton to try her luck in movies, but returned to the court after a seven-year gap. Now she's using her acting to finance her true passion. Subhankar Dey went through four racquets en route to beating world no.9 Tommy Sugiarto at India Open on Wednesday, adding yet another impressive upset to his resume. An unexpected first-round win at the India Open means the world No. 109 pair of Doha Hany and Hadia Hosny El Said have had to extend their leave by a few more days. With the India Open moving to a venue with reduced drift, Sameer Verma aims to take it one match at a time in conditions that will suit his game. 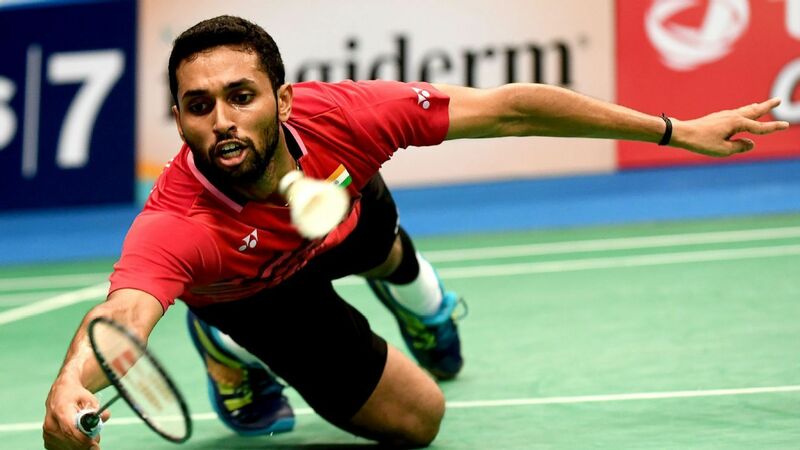 B Sai Praneeth's inspired run at the Swiss Open came to an end after he lost 21-19, 18-21, 12-21 to world no. 2 Shi Yuqi in the final on Sunday in Basel. With this loss, Praneeth has now lost both his matches against Shi on the international circuit. The ESPN.in Awards recognise the best individual and team performances in Indian sport on a calendar-year basis, chosen by a jury that includes some of the biggest names in the fraternity. From Saina Nehwal's sensational comeback year to Manika Batra stealing the show in the TT arenas at the CWG and Asian Games, here are the nominations for the Sportsperson of the Year (Female) award. Saina suffered a 15-21, 19-21 loss against two-time defending champion Tai, while Srikanth went down 12-21, 16-21 to Kento Momota later in the day. Saina Nehwal came from behind to beat Line Kjaersfeldt, while Kidambi Srikanth beat Indonesia's Jonatan Christie to advance to the All England Open quarterfinals. PV Sindhu lost 16-21, 22-20, 18-21 to South Korea's Ji Hyun Sung in the opening round of the All England Open on Wednesday. While PV Sindhu and Saina Nehwal always remain a threat, they are aided by Carolina Marin's absence and Tai Tzu Ying's form, while Kidambi Srikanth faces a tough draw. From Jaspal Rana guiding the next generation of India's promising shooters to Sjoerd Marijne rediscovering his mojo with the women's hockey team, here are the nominees for the Coach of the Year award. World No. 10 PV Sindhu expressed her happiness over participating in her first Olympics as she became one of the seven badminton players to make the cut for Rio Olympics 2016. John Brewin reviews the eight matches that ultimately doomed Louis van Gaal's tenure as manager at Manchester United. Is Beyonce an athlete, too? Joy Priest explores the musician's roots as a young runner in the South and examines how the musician trains like a competitive sportswoman. Was Cozier the last of a golden age of commentators? © 2019 ESPN Sports Media Ltd. All rights reserved.